Dependable technicians available for overhead door springs repair. One of the most important parts of maintaining a garage door opener system is going to be garage door opener troubleshooting. Many times with some simple knowledge and steps you can do your own opener troubleshooting, but you may want to call on our Auburn garage door company professionals. Especially if the problem is not immediately apparent or you find that the problem with your garage door opener is larger than you can handle. There are many issues that can come up with a garage door opener that can make it malfunction. The best way to not deal with garage door opener breakdowns is to do the proper maintenance. You also need to read the manual that came with your opener, or consult one of the professionals, at the Auburn garage door company, to make sure you are operating it correctly. If you discover a major issue with you opener, call the Auburn garage door company. There are three kinds of opener systems: screw drive, chain drive, and belt drive. The experts, at the Auburn garage door company, can repair them all. The screw drive garage door opener system works by the use of a mechanism that lifts the garage door and moves along a steel rod that is threaded. Screw drive systems provide a lot of power and since there are very few parts that move, they do not require a great deal of maintenance. The main part of a screw drive opener is located in the middle of the ceiling in your garage. The most common type of opener systems is the chain drive. Chain drive opener systems have a metal chain that lifts the door up to meet with the tracks. Chain drive openers are, generally, the least costly, but can also be the nosiest. The professionals, at the Auburn garage door company, can easily install and maintain any chain drive opener system. 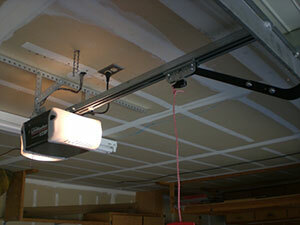 Just as with the screw drive system, the chair drive's main component is in the center of the ceiling in your garage. The belt drive opener system is the quietest of all three types. A belt drive system is going to be the best type to have installed by an expert installer from the Auburn garage door company, if your garage is near a regularly used living space. The belt drive system works much like the chain drive system but instead of a chain, that can be noisy, it uses a smooth running, strong belt made of rubber. There are many manufacturers of garage door openers that the Auburn garage door company can install. One of the most well-known is the Genie Company. Industry, consumers, and even the military use genie openers. Genie openers are so liked because their remote control is so powerful. There are many types of Chamberlain opener systems as well. The most popular being the Liftmaster opener, which can come in belt drive, chain drive, or screw drive garage door opener models. The professionals, at the Auburn garage door company, can also discuss your options from Sears openers. One of the most popular is the Craftsman opener, which has a half horsepower model and a three-fourth horsepower chain drive model. Craftsman openers also come with great features like a remote control that is universal, entry pad that is key-less, a light control for garage door that you plug in, and a garage door monitor that is wireless. Last, the experts, at the Auburn garage door company, can set you up with the Marantec openers system. These openers were engineered in Germany and are made in America by the Marantec opener company. These opener systems are built to last, designed for great performance, and have perfect garage door opener technology over the last 30 years.